Looking for a quick and easy pasta salad? This Classic Italian Pasta Salad Recipe makes a great side dish, feeds a large crowd, and is perfect for any party or potluck! 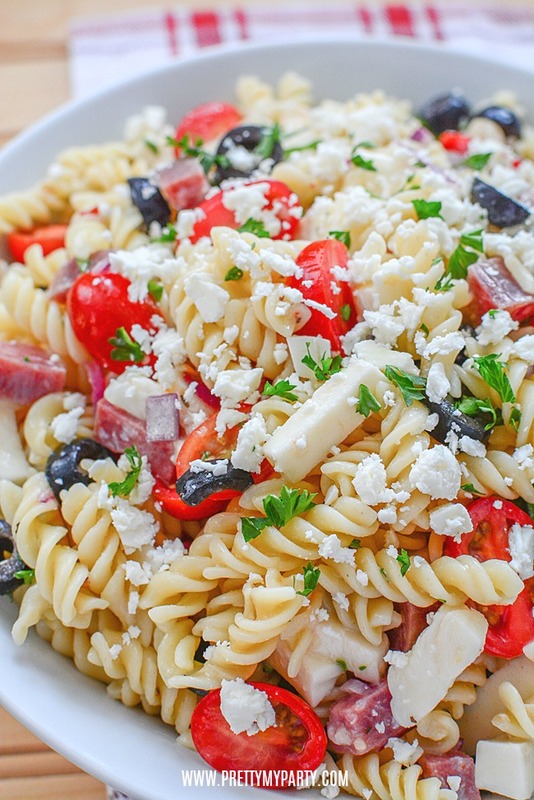 There’s nothing better than a delicious classic pasta salad in the spring or summer months. This Easy Classic Italian Pasta Salad has been a family favorite since I was a little girl. This classic pasta salad recipe pairs perfect with burgers, chicken, or steak and is packed with robust flavor. If you love Italian dressing then you’re in for a treat because this pasta salad has the perfect zesty Italian kick your taste buds will crave! During the summer, we like to have friends and family over for barbecues. We have a nice screen room on the back of our house where we sit and enjoy grilled food and cold drinks without the bugs bothering us. Our summer get-togethers usually tun into a potluck since everyone offers to bring a dish. This is great because it takes the stress off of me and I can enjoy other people’s recipes. 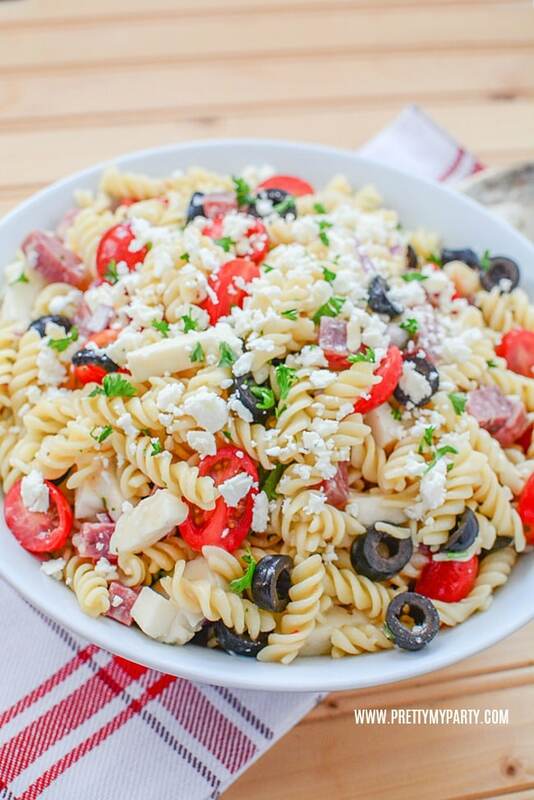 The next time your invited to a summer barbecue, graduation party, birthday, Fourth of July or Memorial Day party, whip up this delicious classic pasta salad with Italian dressing. It’s a quick and easy pasta salad recipe that can be done in no time, so if you need something to bring to a party last minute, this side dish is perfect. 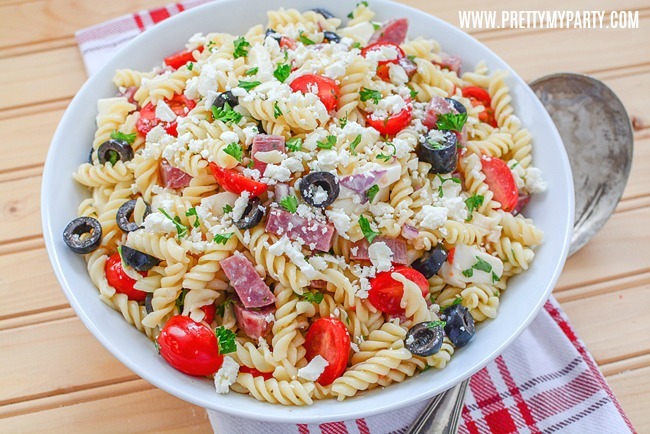 Plus, this is the best pasta salad you will ever have! What’s great too is that kids will love it. If you’re having a kid’s birthday party at home, this is the perfect side dish. My son loves it. Plus, it’s the perfect way to get him to each some vegetables! If you’re wondering how to make this Easy Classic Italian Pasta Salad for your next party or barbecue, you can grab the recipe below. What’s great about this recipe is that it’s colorful and full of fresh vegetables and tender pasta. It’s perfect to take on the go and feeds a crowd. For this classic pasta salad you have two options. You can make a homemade Italian dressing or you can buy your favorite from the grocery store. I’m usually pressed for time, so I usually just buy my favorite dressing from the store. You can also experiment with different dressings if you’re looking to put your own spin on this classic pasta salad. Some Italian dressing substitutes for this recipe include a Parmesan-pepper vinaigrette, a balsamic vinaigrette, or a tomato basil vinaigrette. For this Classic Italian Pasta Salad Recipe you will need a large pot and a large bowl with a lid, especially if you will be taking the dish with you to a party. My suggestion for this Italian pasta salad is to make it ahead of time and leave it in the refrigerator. The more time the pasta has to soak in the delicious zesty Italian dressing, the more flavorful and delicious it will be. What kind of pasta is used for pasta salad? 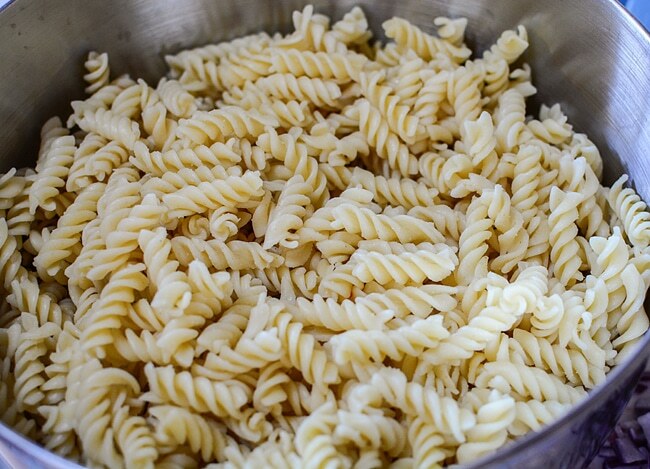 Short pastas like rotini, penne, fusille or farfalle are most commonly used in pasta salad recipes. But it’s your pasta salad, so pick whatever pasta you like. How do you cool pasta salad? To cool your pasta salad, strain it, run it under cold water to cool it completely. Then give it a good shake to make sure it is dry. Add it to a large bowl and toss in a little olive oil to prevent the noodles from sticking. What do you put in pasta salad? What you put in your pasta salad is totally up to you depending on your likes and dislikes. Some people add cucumber, carrots, peppers, celery, etc. What kind of dressing do you use in pasta salad? In the Classic Italian Pasta Salad the most common dressing is Italian dressing. You can add a bottle of your favorite store-bought Italian dressing or you can make a homemade version. Other dressings that pair well with pasta salad include Greek or Balsamic dressings. Again, it’s up to you and what you like. How long can you keep pasta salad? Pasta salad is good for 5 to 7 days in the refrigerator. If you opt for a creamier dressing for your pasta salad and use mayonnaise, keep in the refrigerator for 3 to 5 days. This Easy Classic Italian Pasta Salad is the perfect side dish and pairs well with chicken, steak or burgers. With tender pasta, fresh vegetables and zesty Italian dressing, this pasta salad recipe will be a family favorite. It also makes the perfect dish for parties or potlucks. 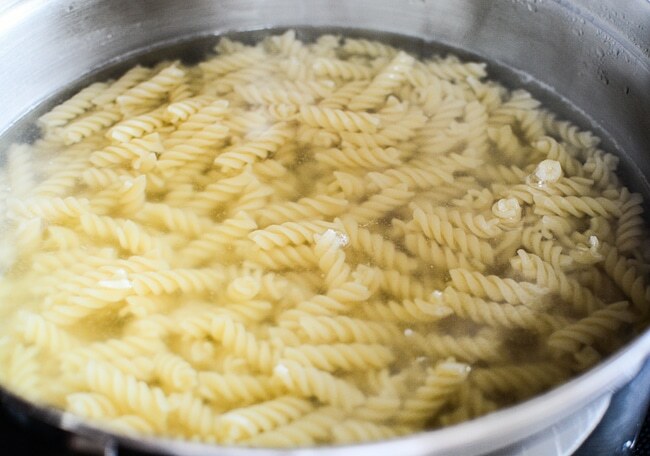 To cook pasta, add 4 quarts water and 1 tablespoon salt to boil in a large pot. Add pasta and cook according to instructions on box (About 8 to 10 minutes or until al dente). Drain well and rinse under cold water. 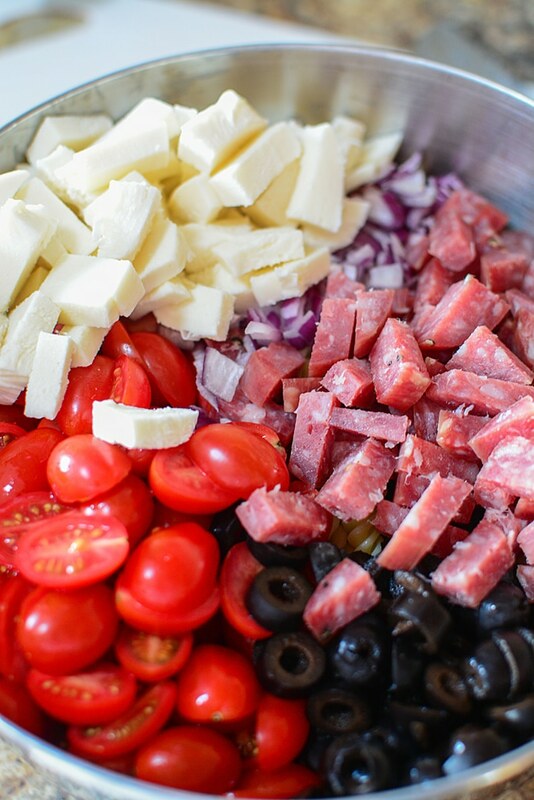 In a large bowl, toss in the pasta, salami, mozzarella cheese, tomatoes, olives, and onion. Add 1 bottle of store-bought Italian dressing or homemade dressing and mix well or toss until evenly coated. 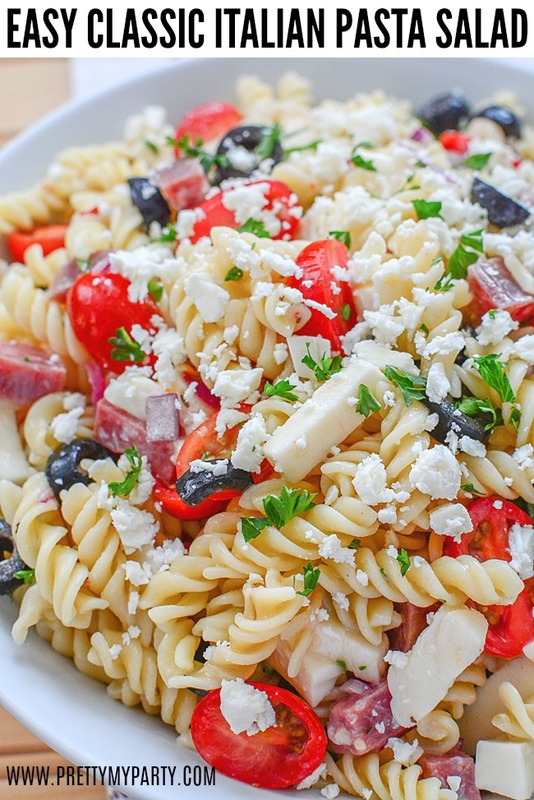 We would love, love, love it if you share this classic pasta salad recipe! For your next party or potluck, try this Easy Classic Italian Pasta Salad Recipe and come back and give it a rating! 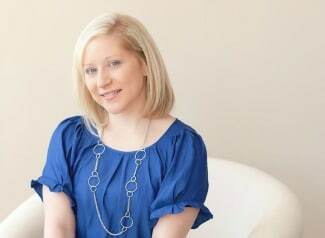 We would love to know what you think! It looks very delicious maybe later I will try your recipe. Thanks!